For the last 25 years, a friend and I have been worker/members of Western Minnesota Steam Threshers Reunion, a Steam Thresher/Tractor show in our hometown of Rollag, MN. During the Labor Day Weekend show, we stayed at home until we were old enough to camp on our own and have been tenting with our friends for several years now. 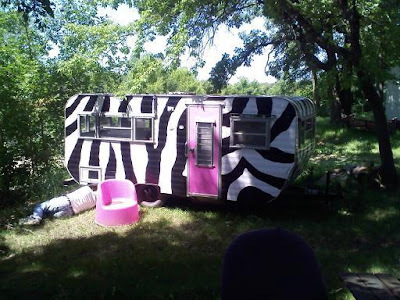 Until this year...we managed to get our hands on an old camper/ice-fishing house and fixed it up 'bachelorette' style and to match our hot pink golf cart, naturally. I'm pretty proud.